Lead-lined window frames are only quoted with glass. Please use the Leaded Glass Quote form for pricing on lead glass and lead-lined frames. 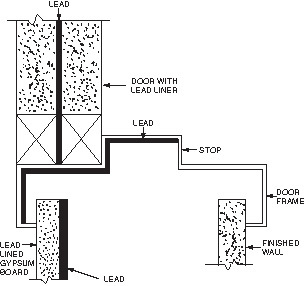 VIEW LEAD LINED DOOR FRAME SUBMITTALS. 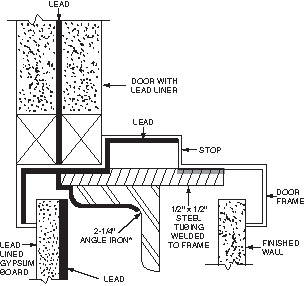 Radiation Protection Products' Standard Lead Lined Door Frames consist of 16-gauge steel, a 2" face, and a 5-7/8" jamb depth. These lead lined door frames are set up and welded and can accommodate up to 1/2" thick lead lining. Our Lead Lined Door Frames are shipped with steel stud anchors that can be attached to the lead lined door frame either by welding or with steel fasteners if the lead lining does not exceed 3/32" thick. 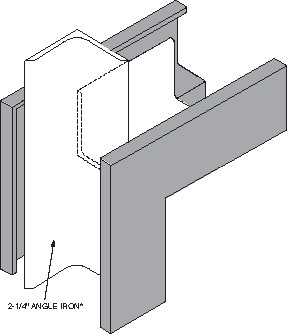 We require the use of an Angle Iron for added support on Lead Lined Door Frames that require 1/8" thick lead or higher. These Angle Irons can be spot welded to the steel stud or pre-drilled and bolted to the steel stud. *We do offer angle irons on our lead lined door frames that are below 1/8" thick lead if requested. We can supply knock down, slip and other lead lined frames upon request. Our Lead Lined Frames can also be equipped with the type of anchors necessary for any given situation (wood stud anchors, masonry strap anchors, etc.). Although our standard Lead Lined Door Frames consist of 16-gauge steel, we offer frames at 14-gauge and 12-gauge as well. For complete radiation protection, contact Radiation Protection Products or request a quote.